Time and time again football fans have witnessed preseason injuries ruin seasons for teams contending for championships. Within eight days, fans of one NFL team watched two injuries potentially jeopardize the upcoming season. One of those injuries could jeopardize a player’s career. The Buffalo Bills entered the 2013 preseason with two quarterbacks competing for the starting position. On August 17 the team announced that first-round draft pick EJ Manuel would need a “minor knee procedure” and would miss the remainder of the preseason. Veteran Kevin Kolb, who the Bills signed in the offseason despite a career hampered by injuries, became the team’s starter. Unfortunately, those injuries quickly came back to haunt him. In the first quarter of a preseason game against the Washington Redskins Saturday, Kolb scrambled for an eight-yard run. As he dove for a first down, a Redskins defender kneed him in the back of the head. Kolb stayed on the field for the drive’s final four plays, including a touchdown run by CJ Spiller. Kolb soon left for the locker room with what the Bills described as “concussion-like symptoms,“ according to ESPN.com. He never returned to play. Does fear of getting benched keep players from reporting concussions? Shortly after the injury, both Graham and ESPN’s Adam Schefter reported that the Bills believe Kolb’s concussion could be career-ending. How could a knee to the head, especially one where a player could stay in the game, end his career? In Kolb’s case at least, fans only need to turn to his recent injury history for the answer. According to another reporter for The Buffalo News, Mark Gaughan, Kolb has suffered at least two concussions before this one, including one severe concussion. On December 11, 2011 Kolb suffered a concussion that caused him to miss his team’s final three games. Ryan Wilson of CBSSports.com reported that Kolb did not fully recover for about seven weeks, including three weeks after the season ended. Schefter reported that Kolb would undergo further tests. The Bills do not want to rush him back to football, even if he can ultimately return to play. A study published last week in the American Journal of Sports Medicine suggests that the team’s cautious approach is justified. Tracey Covassin, PhD, AT and others at Michigan State University examined concussion symptoms and performance on cognitive tests among athletes with three or more concussions. They compared the results to those of athletes with a history of fewer or no concussions. Is the future of football in jeopardy? 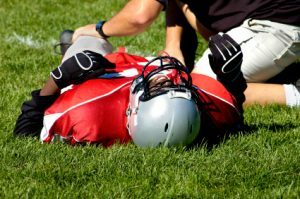 The researchers found that athletes with a history of three or more concussions were still impaired on tests for verbal memory and reaction time eight days after the concussion. Coupled with previous research on multiple concussions, the implications for athletes are frightening. Athletes with multiple concussions tend to have more symptoms, such as headaches, dizziness, and nausea, at the time of injury. Athletes with multiple concussions tend to perform worse on tests of cognitive performance and attention. Multiple concussions are associated with longer duration of symptoms and slower recovery. The Buffalo Bills are scrambling to fill the hole left at quarterback by the injuries to Manuel and Kolb. Manuel appears likely to return in a few weeks, so those eight preseason days might not have ruined the team’s season. Meanwhile Kolb’s return this season is uncertain. His preseason injury, on top of his prior concussions, might end his football career. Note: A modified version of this post appears as my sports medicine column in the August 30, 2013 issue of The Post and Courier. Covassin T, Moran R, Wilhelm K. Concussion Symptoms and Neurocognitive Performance of High School and College Athletes Who Incur Multiple Concussions. American Journal of Sports Medicine. Published online before print August 19, 2013. Episode 106: Are critics of football and its injury risks overreacting?